Many homes between 1,400 square feet and 2,100 square feet require a 3 ton air conditioner for adequate cooling. Doing a complete load calculation is the only way to know exactly what size unit a home needs, but 3 ton air conditioners are very common. Prices vary quite a bit, with the level of efficiency being the largest factor in determining cost. Brand name and performance features may also affect the cost. Once homeowners know the size unit they need, their next question is often about efficiency. It is usually most cost effective to install a high-efficiency central air conditioner in warm climates, and homes in cooler climates might do better with a standard or mid-efficiency model when equipment cost is compared to energy bill savings. Because each homeowner has different needs, we’ve pulled together a sampling of 3 ton air conditioner prices representing low, medium and high priced models. The models we chose as examples are among the best in their class. You can see their complete list of features by following the links. American Standard has quietly been producing high quality HVAC equipment for generations. The American Standard Silver XI 14 central air conditioner offers basic, no-frills service that most consumers rate as very reliable. The cost is excellent, and it offers very respectable 14 SEER performance. The Duration compressor is dependable and the unit is backed by a 10-year limited warranty. Most homeowners will get 15-20 years service from this model. The Dave Lennox Elite series is Lennox’s best, and this one offers good efficiency and performance features that will make any home more comfortable. The 17.2 SEER rating means lower energy bills and features like Humidtrol and quiet operation make the Dave Lennox Elite Series XC16 3 ton central air conditioner a popular choice. Year after year, Armstrong is one of the most reliable brands in consumer ratings. The Armstrong Model 418LE 18 SEER central air conditioner will significantly reduce energy costs with its 18 SEER rating. It’s performance will make your home more comfortable. Top features include a 2-stage compressor and condensing unit improvements that greatly reduce noise. This is a very good choice in warm climates where a rugged, workhorse central air conditioner with very high efficiency is essential. These are good models to start with as you compare 3 ton air conditioner prices and features. 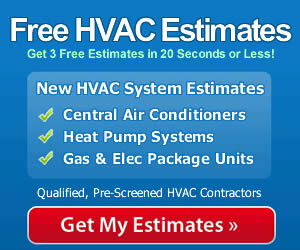 See other HVAC Prices reviews for comparable models and what they have to offer. By comparing models you’ll find the one that matches your budget, performance preferences and the SEER rating that makes the most sense for your climate. Need price to install 2.5 and 3 ton HVAC inits. Also have other house that needs same units.